Today marks the 65th anniversary of Queen Elizabeth’s ascension to the throne. It was a sad day for the princess because her father had passed away. 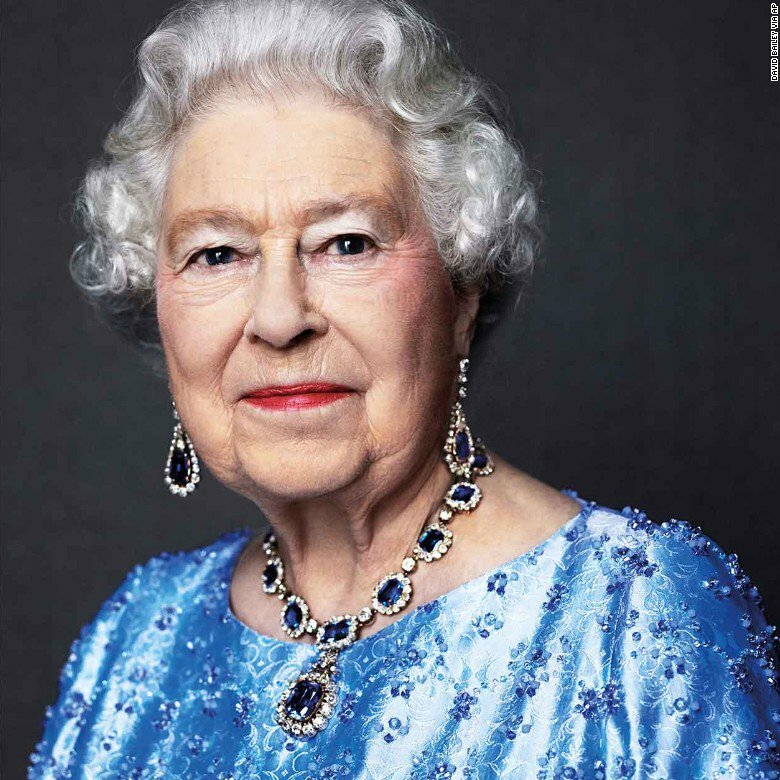 She is the longest-reigning monarch in British history. The Clinton Library posted this photo to mark the occasion. Best wishes to Queen Elizabeth on her #SapphireJubilee. This photo was taken Dec. 14, 2000. I know we all get a lot of emails from many people – big names included – asking us to support Hillary. This one is special. Thank you President Carter! We love you! During my 1976 presidential run, a young woman moved to Indianapolis to help turn out the Indiana vote for me. Forty years later, I will proudly cast my vote for that same woman to be the next President of the United States. Hillary is going to need more than just my vote, though. She’s got to keep building a campaign that can beat Trump soundly, and that takes resources. Chip in $5 to make sure her team raises $10 million by the FEC deadline on August 31st. 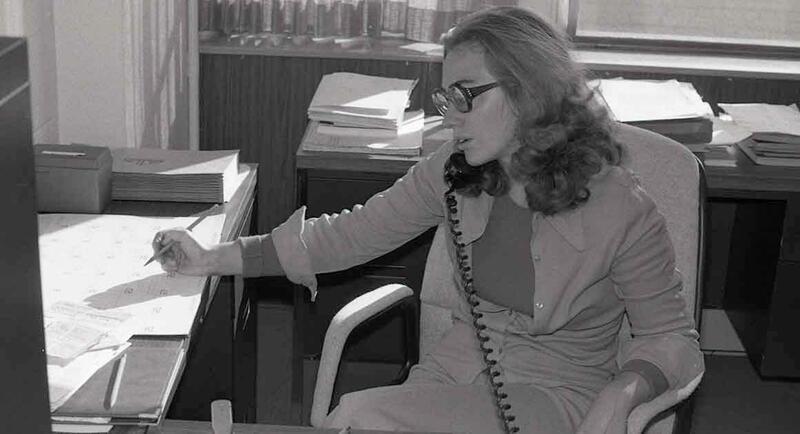 I’ve known Hillary for decades — and her record as a public servant is superb. In 1977, I appointed her to the board of the Legal Services Corporation (LSC), a nonprofit that provides legal assistance to Americans in need — she went on to become the first woman to chair the board. Over her tenure, funding for the LSC tripled, allowing the organization to expand legal aid to every congressional district, and handle 1.5 million cases for poor clients each year. 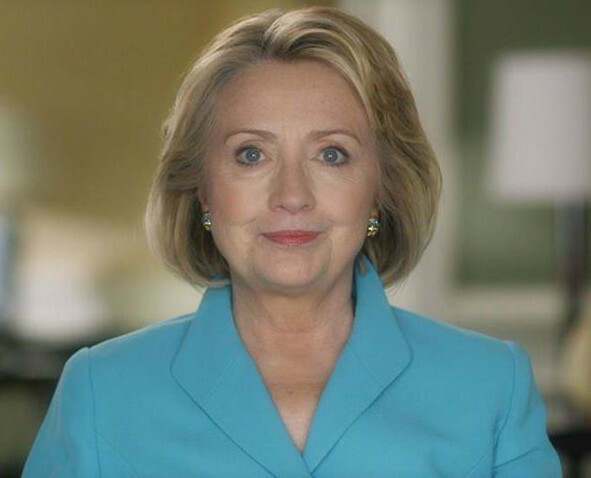 As First Lady, Clinton continued to advocate for legal services funding. 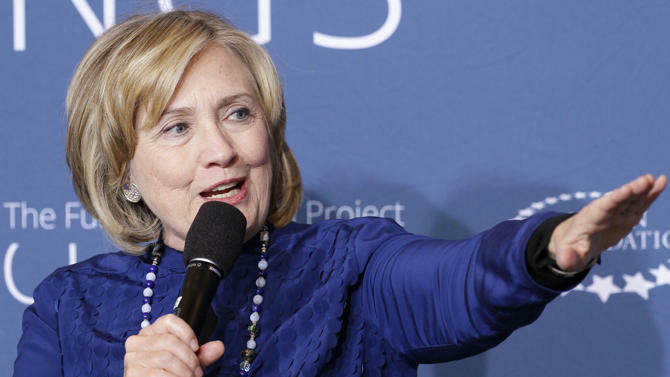 That’s a special thing about Hillary — when there’s a job worth doing, she doesn’t abandon it. Work she did decades ago, like founding Arkansas Advocates for Children and Families or helping start the Children’s Health Insurance program, is still changing lives today. Her entire career has been a fight for progress, and as our president, she’ll make sure we’re on the cutting edge of civil rights, economic justice, climate change, and more. She is the only candidate prepared to take us into the future. When I left the White House in 2001 and returned to life as a private citizen, I wanted to continue working in areas I had long cared about, where I believed I could still make an impact. That’s what the Clinton Foundation has tried to do, by creating opportunities and solving problems faster, better, at lower cost so that more people are empowered to build better futures for themselves, their families, and their communities. I am grateful to everyone in the U.S. and across the world who has been involved in our work, and especially grateful to Chelsea for her role in increasing scope and impact. From day one, the Foundation has pursued its mission through partnerships with governments, the private sector, other foundations, and philanthropists, creating networks of cooperation that are focused on results. In 2005, we convened the Clinton Global Initiative (CGI) to give people all over the world the chance to do the same thing. More than 11.5 million people in over 70 countries have access to lifesaving HIV/AIDS drugs at 90 percent lower cost through our affiliated Clinton Health Access Initiative (CHAI), including more than 800,000 children. That’s more than half the adults and three quarters of the children on treatment today. CHAI has also organized the training of thousands of health care workers as part of an effort to address critical shortages in poor countries and help others build strong, self-sufficient health systems, and expanded access to high-quality, low-cost treatment and diagnostics for many other diseases and conditions. Through our work with the affiliated Alliance for a Healthier Generation, more than 18 million students in over 31,000 American schools, in every state, now have healthier food and more physical activity options, and our agreements with the beverage industry have reduced the caloric intake from drinks by 90 percent in the vast majority of U.S. schools. Our Health Matters Initiative is working in six communities to improve health and has worked with innovative drug companies to help reverse opioid overdoses and combat prescription painkiller misuse by lowering the cost of autoinjection naloxone and making naloxone nasal spray available to every high school in the U.S. at no cost. The Foundation’s Haiti initiative has promoted sustainable investment resulting in the planting of more than 5 million trees and removing a storm damaged tree services, the development of 5 new agricultural supply chains benefiting more than 4,000 smallholder farmers, and support for more than 20 entrepreneurial businesses. And members of CGI’s Haiti Action Network have made more than 100 Commitments to Action to strengthen the health, education, agriculture, and infrastructure sectors. Our climate change projects have reduced greenhouse gas emissions by more than 33,500 tons annually across the U.S. We’ve also partnered on reforestation and land restoration efforts in South America and East Africa, and are working with island nations to develop renewable energy projects and reduce dependence on expensive imported diesel and petroleum. More than 500,000 people in Latin America are benefiting from social enterprises that connect people to job training, supply chains, and entrepreneurship opportunities. More than 105,000 farmers in East Africa have dramatically increased their yields and their incomes. And, through Too Small to Fail (TSTF), we are working with the faith-based community, pediatricians, community and business leaders, and Head Start educators to provide parents with resources in everyday settings to support their young children’s early brain and language development, and have reached 155,000 parents with tips through direct text messages. I have found great joy in simple moments shared with people who are benefiting from our work: holding a baby who is alive and healthy because he now has access to AIDS medication; planting rows of seeds with smallholder farmers in Malawi and hearing about how our programs have lifted their incomes, enabling them to send their children to school and electrify their homes; meeting with female entrepreneurs in Peru who are earning a good living for the first time in their lives by providing essential goods to their remote communities. This work has been my life for the last 15 years, and I couldn’t be more grateful. Since Hillary began her presidential campaign in 2015, Chelsea and I have made it clear that the work the Clinton Foundation started should continue if Hillary is elected, but that changes would be necessary. While it would be presumptive to assume a victory in November, now that Hillary is her party’s nominee, it would be irresponsible not to plan for it. 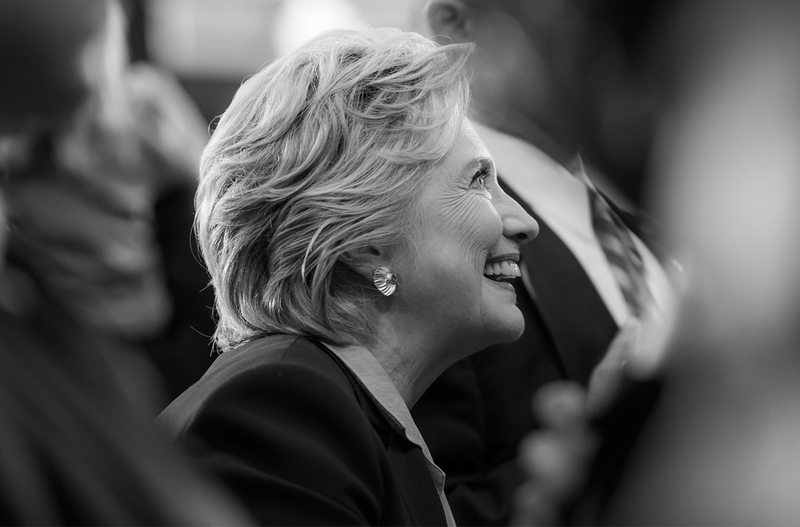 If Hillary is elected president, the Foundation’s work, funding, global reach, and my role in it will present questions that must be resolved in a way that keeps the good work going while eliminating legitimate concerns about potential conflicts of interest. Over the last several months, members of the Foundation’s senior leadership, Chelsea, and I have evaluated how the Foundation should operate if Hillary is elected. Throughout the process, our top priorities have been preserving our most important programs, supporting the people who work for the Foundation and its affiliated programs, and resolving legitimate conflict of interest questions. If she is elected, we will immediately implement the following changes: The Foundation will accept contributions only from U.S. citizens, permanent residents, and U.S.-based independent foundations, whose names we will continue to make public on a quarterly basis. And we will change the official name from the Bill, Hillary & Chelsea Clinton Foundation to the Clinton Foundation. While I will continue to support the work of the Foundation, I will step down from the Board and will no longer raise funds for it. Much of the Foundation’s international work, like that of most global NGOs, is funded in part by donor governments’ bilateral aid programs. If Hillary is elected, we will transition those programs out of the Foundation to other organizations committed to continuing their work. Doing this in a way that ensures continuity and is respectful of all the employees working around the world will take time. We will complete these transitions as soon as we can do so responsibly. With respect to CHAI, I will step down from the Board. We, along with the CHAI Board, are additionally considering a range of options to ensure that its vital work will continue and will announce details soon. The Clinton Foundation was originally established to build the Clinton Presidential Center and Library in Little Rock, and the work there will continue regardless of the outcome of the election. Since opening its doors 12 years ago, more than 4 million people have visited the Center and it has helped to inspire new generations of leaders—including through the Presidential Leadership Scholars program, a bipartisan educational partnership with the George W. Bush Presidential Center, the George Bush Presidential Library Foundation, and the Lyndon Baines Johnson Foundation. The Center has lived up to my vision and much more, including as an important educational and cultural resource and driver of economic growth for the Little Rock community. Finally, the Clinton Global Initiative (CGI) has accomplished even more than I dreamed when it began in 2005, and we’ve made the decision that the Annual Meeting this September will be the last, and that we will no longer hold our CGI America meetings. Nine years ago in my book Giving, I wrote, “I want to continue these meetings for at least a decade, with the objective of creating a global network of citizen activists who reach across the divides of our interdependent world to build real communities of shared opportunities, shared responsibilities, and a genuine sense of belonging.” That is exactly what CGI, its members, and its dedicated staff have done. We started CGI to create a new kind of community built around the new realities of our modern world, where problem-solving requires the active partnership of government, business, and civil society. We’ve brought together leaders from across sectors and around the world both to talk about our challenges, and to commit publicly to actually do something about them. It was something different, but our bet paid off: there was a hunger for the chance to make an impact that brought together people and organizations with the resources to make a difference with people who have the knowledge and experience to turn good ideas into action. Corporations, governments, and non-governmental organizations began combining their strengths and finding entirely new approaches to old problems. CGI quickly became an embodiment of what works best in the 21st-century world, and what has been behind all of the Clinton Foundation’s work since the very beginning: networks of cooperation. This partnership model, which may seem self-evident today, was simply not how philanthropy and corporate responsibility worked over a decade ago. Today, members of the Clinton Global Initiative have made more than 3,500 commitments that are already improving over 430 million lives in more than 180 countries. These projects will continue to make an impact around the world and in the U.S. The idea that working together beats going it alone has caught on well beyond our CGI community. It’s been one of the great honors of my life to be part of this special community, and I hope the hard work and benefits of CGI’s great staff and its members’ creative cooperation will keep rippling out into the world. The commitment model has been adopted by other forums and I hope that more will do so, or that new organizations will arise to do this work. While this year will be the last for the CGI Annual Meeting and CGI America, I hope and believe we can and should preserve CGI University (CGI U), our meeting that brings university students together to develop innovative solutions to important challenges in the U.S. and around the world. In addition to continuing CGI U and all of the activities of the Clinton Presidential Center, the Foundation will also continue those domestic programs that can be maintained with the funding restrictions we announced today. The process of determining the Clinton Foundation’s future if Hillary becomes President has not been easy. 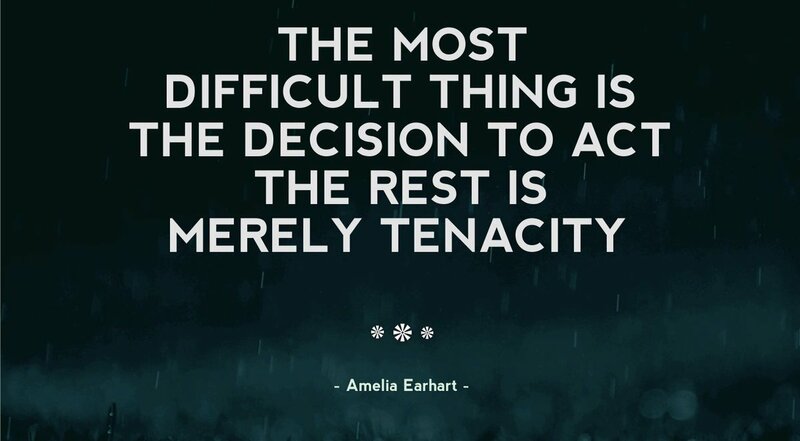 It’s an unprecedented situation, so there’s no blueprint to follow. Part of what has made the Foundation successful over the last 15 years has been our understanding that solving problems and creating opportunities faster, better, and in the most cost-effective way sometimes means changing course. Working alongside so many passionate people around the world who share our goals and believe in our approach has made these 15 years one of the most rewarding chapters of my life, as I know it has been for Chelsea. While my role in that work will change, the work itself should continue because so many people are committed to it and so many more are relying on it. Chelsea and I are very proud of what the Clinton Foundation, its affiliates, and its partners have accomplished, and we are profoundly grateful to the staff, to those who have funded our work, and to all the people with whom we have worked and from whom we have learned so much. We will try to be faithful to them, their values, and their work in effecting this transition as quickly and effectively as possible. The Clinton Foundation convenes businesses, governments, NGOs, and individuals to improve global health and wellness, increase opportunity for girls and women, reduce childhood obesity, create economic opportunity and growth, and help communities address the effects of climate change. No matter what his stable-boys say to try to clean up his remarks, his meaning was clear. Republican presidential nominee Donald Trump, speaking at a rally in Wilmington, N.C., on Tuesday, appeared to encourage gun owners to take action if Hillary Clinton is elected president and appoints judges who oppose gun rights. The mogul said that Clinton “wants to abolish, to essentially abolish the Second Amendment,” a charge she has flatly denied. He said that if Clinton becomes president, she could appoint judges that would leave Americans nearly helpless on this front. In democracies, we campaign in language. Candidates cannot take action until/unless they are elected to office. The implication is very clear. Whether he tries to defend his words as sarcasm or as jokes, this kind of rhetoric has no place on the presidential campaign trail. None! After Donald Trump’s comments in Wilmington, NC today, Hillary for America Campaign Manager Robby Mook released the following statement: “This is simple—what Trump is saying is dangerous. A person seeking to be the President of the United States should not suggest violence in any way. Lincoln, Garfield, McKinley, JFK, RFK, MLK, and attempts on TR, FDR, Ford (twice), Reagan (badly – nearly fatal) and George Wallace (presidential candidate) all of this not to mention the Rabin analogy which is frighteningly close. The message was very clear and enough is enough. We do not joke about assassination in this country – or anywhere! I agree with Friedman. His children should be ashamed of him, and he should lose all 50 states. He should also lose the “secret ones” wherever they are. Gabriel Gifford's knows what happens when politicians make threats about 2nd Amendment Solutions. 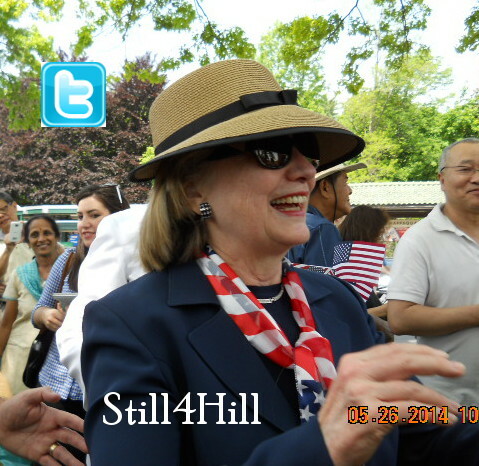 Hillary Clinton is doing this for all of us, and we love her for her selfless campaign. 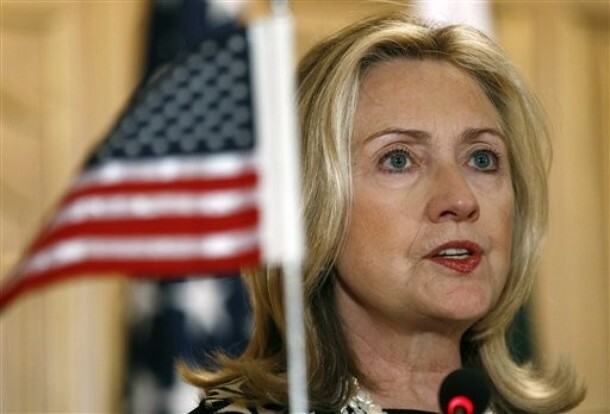 Whatever words people contacted by polling organizations associate with Hillary Clinton, women all over the globe associate Hillary Clinton with the speech. This is that speech. These are the words that billions of women associate with Hillary. Today is the 20th anniversary of this speech. It has been posted here before. I once had the pleasure of watching my TA from China listening to it for the first time. I am posting it again. There is always someone who has not seen or heard it. 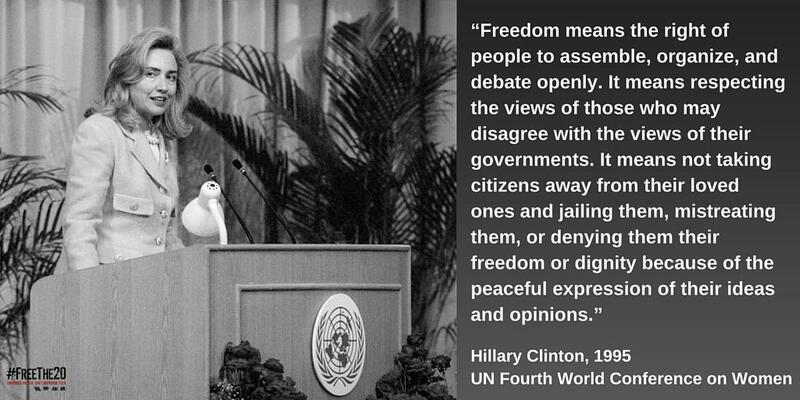 Here is that speech thanks to the Clinton Presidential Library. I’ve seen Bill take on many roles over the years — from father to grandfather, from public servant to philanthropist — but everything he’s done in his life has been tied together in his belief that if we work together, tomorrow can be better than today. When Bill left the White House, he opened the Clinton Presidential Center in Little Rock, Arkansas with a vision to continue his life’s work of strengthening communities and empowering people everywhere to live their best life story. This year we’re marking a full 10 years since the Clinton Presidential Center first opened its doors. On behalf of the Clinton Foundation, I want to invite you to commemorate this moment, and to thank Bill for the lifetime of service that I hope you admire as much as I do. Click here to send a personal note of congratulations to Bill to celebrate 10 years of the Clinton Presidential Center. Bill has devoted his life to making sure people everywhere can achieve their dreams, whether it’s increasing access to life-saving HIV/AIDS medicine in Africa, helping children here in the United States live healthier lifestyles and overcome obesity, or helping more people in more places around the world get access to clean water, clean air, education, and economic opportunity. Bill has always believed we have to put people first, and that’s still at the core of the work we do here at the Clinton Foundation and at the Clinton Presidential Center. The measure is simple — are people better off than when we started? For millions around the world, the answer is yes. 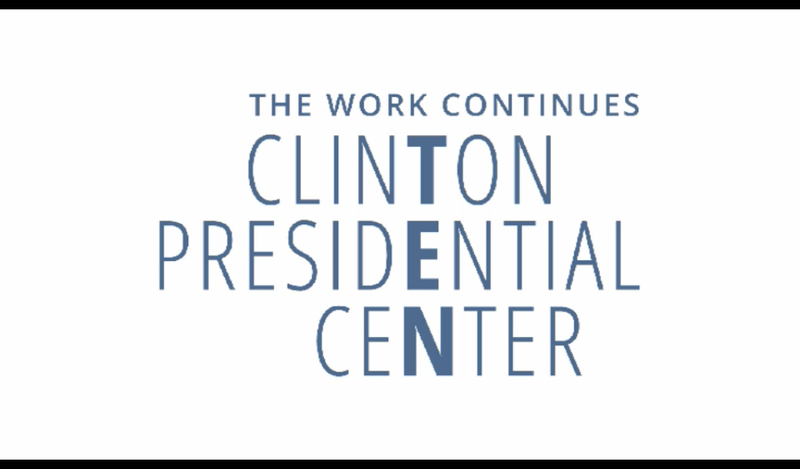 I hope you’ll join me in saying thank you and congratulations on 10 years of the Clinton Presidential Center. Send your personal note of celebration today. The Clinton Foundation also showed up in today’s news of the upcoming royal visit. … the duke will attend a reception focused on conservation issues, co-hosted by the Royal Foundation and the Clinton Foundation. Hillary Rodham Clinton and Chelsea Clinton are expected to attend. 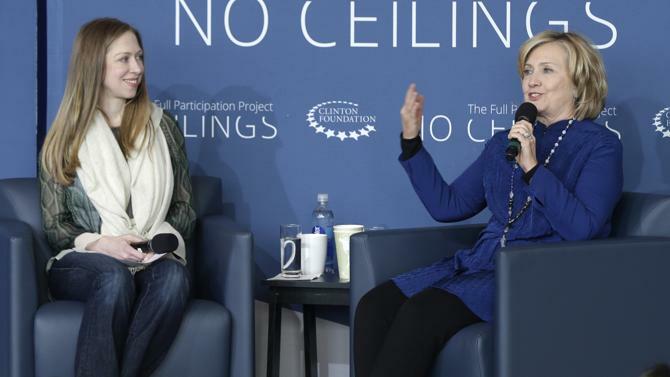 Hillary and Chelsea Clinton took the stage at the 10th Anniversary of the Clinton Presidential Center today to discuss the progress of their No Ceilings initiative. She noted that progress has been made extending elementary education and some secondary education to girls, more needs to be done to confront infant mortality, and a great deal must be done for women to be perceived as members of the formal labor force and to be included in the formal economy. Identification of barriers to inclusion is essential. Provision of child care so that women can fully participate in a transformed workplace is a goal. Chelsea then explained that Beijing was a long time ago (“Don’t remind me!” Hillary added). She stressed the role of technology and said that Facebook is the largest community of women in the world and that progress must be measured via data. An example Chelsea offered is the impact of ebola. She called it a caregivers’ disease which results in caregivers, largely women, also contracting the disease and succumbing in high numbers, but a tangential effect, she pointed out, was the reduction in available women to perform midwife duties and care for newborns resulting in increased infant and maternal mortality. Key to today’s discussion were questions of what works and what models are scalable and flexible enough to be modified as needed for different cultures and environments. Hillary spoke about micro-loans and how that model has been successful in preventing dreams from “dying in bank parking lots,” as a young woman once told her. Barriers here include husbands who want to control the assets once the women get the loans. Guest speakers were local. Annette Dove talked about “Changing Steps” which is meant to inspire and mentor young people from disadvantaged homes to reach higher education goals. Dove spoke of an “imagination gap” that needs to be closed in such communities. Pierre Ferrari spoke about Heifer, of which he is CEO and which provides livestock after training. Chelsea mentioned that her late grandmother, Dorothy Rodham, gave her a heifer for Christmas every year, Ferrari said the organization donates 1.5 million animals a year mostly to women who, he said, do 70% of the labor. Training includes care of the animal (the asset) and handling the profits. Ferrari said 85% of the decisions are made by women and that data shows that once they have proven their economic skills in the home, the husbands of the women tend to support their participation in the larger economic community. 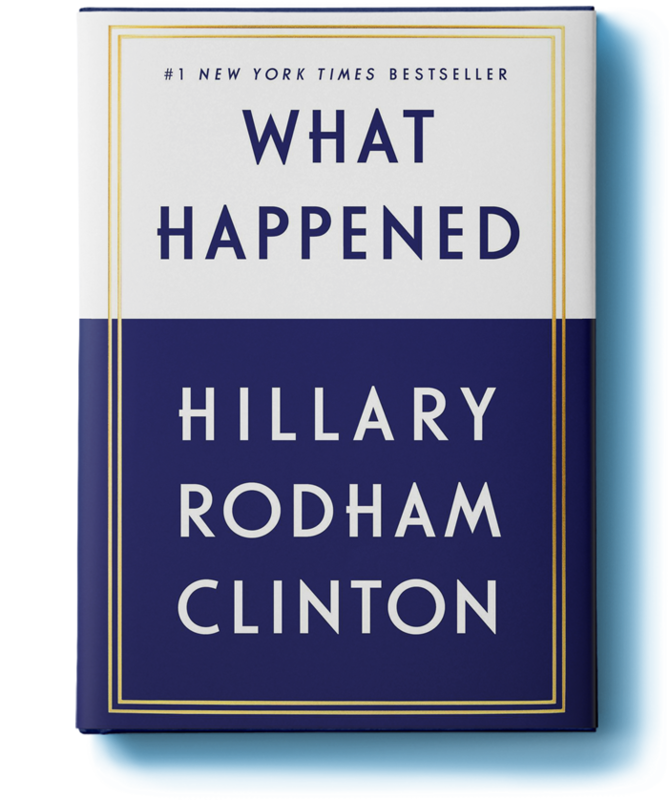 Hillary, at this point, mentioned the book Beatrice’s Goat, a true story for which she wrote the foreword. 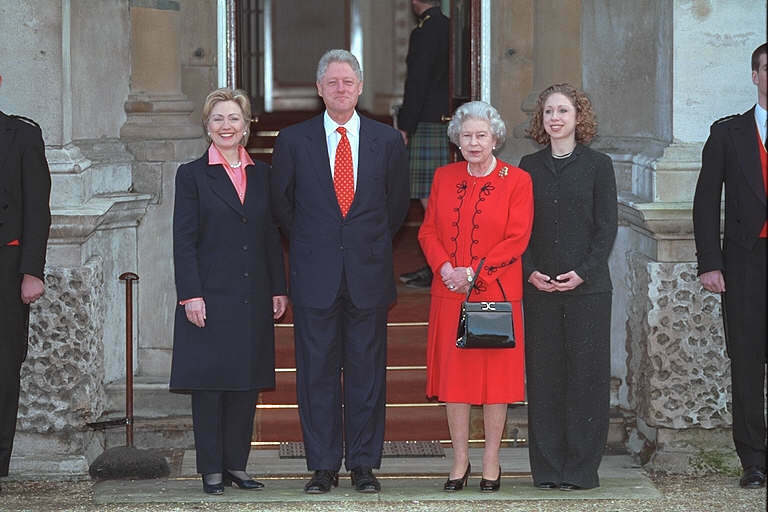 Beatrice of the story went on to study in the U.S., interned for Hillary in her Senate office, and eventually got a master’s degree from the Clinton School in public policy. 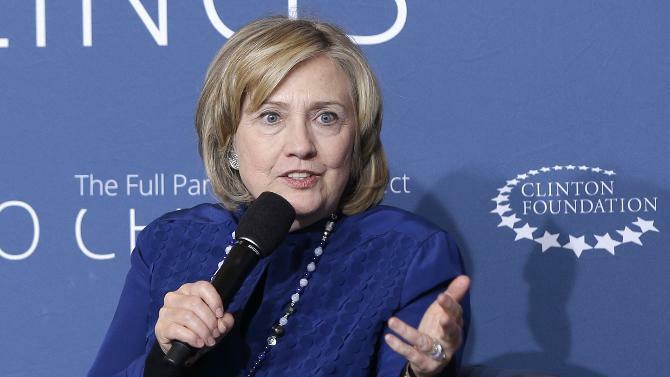 Hillary also said that the barriers to women’s progress is often surprising. Chelsea offered the recently reported forced sterilizations in India wherein the mothers-in-law are often the ones forcing the daughters-in-law to be sterilized after the requisite number of sons have been produced. One cannot help but notice the proprietary role the mother-in-law takes in such a case coming right on the heels of the livestock discussion. Daughters-in-law are not goats. Anna Strong from Arkansas Children’s Hospital spoke of several programs offered through the hospital’s auspices including HIPPY (encouraging parents to begin teaching children at home), a health center run out of an elementary school, and an advocacy group for children and families. Hillary added that HIPPY began in Israel during the wave of Ethiopian immigration. 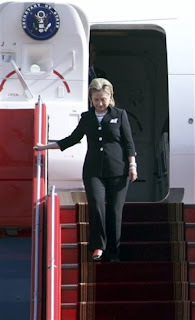 As FLOAR Hillary had the founder visit Arkansas. I lost the feed, and sadly did not get the name of the next excellent speaker who spoke of a single-parent scholarship fund model that began with two funds and has been replicated to 62 funds (eminently scalable). She noted that the funds make a permanent dent in poverty and raise the overall education level in the state. The key word for the day was, as I said earlier, scalability. All of these programs can be replicated with necessary modifications. 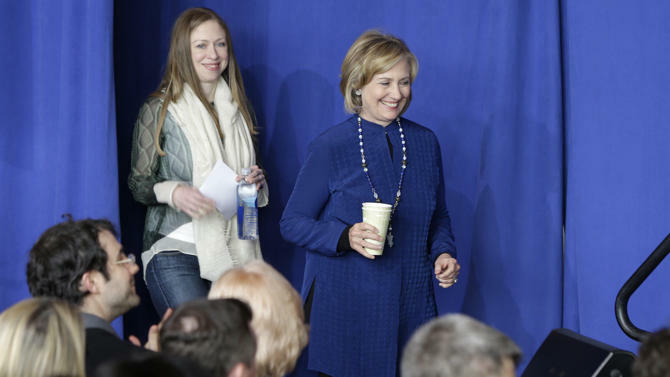 The key, as Hillary, Chelsea, and other speakers emphasized is what works. No single formula works everywhere. Hillary stressed that policy decisions should be based on evidence that a program or policy works (or does not work) and not upon ideology. The Q&A that followed consisted entirely of people’s own creative ideas and models that they wanted to share rather than questions. Well, after all, it was a Clinton event and people are used to CGI formats where you bring forth your ideas and projects. There was a moment. and it was adorable. 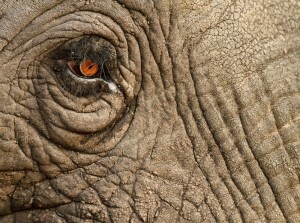 We all know that in addition to this No Ceilings initiative, Chelsea and Hillary also have an anti elephant-trafficking effort and Too Small to Fail to encourage parents to help their pre-schoolers be ready for reading and numbers. Part of that effort involves talking to babies and exposing them to words. At one point, Chelsea, in response to a remark by Hillary, referred to “what Grandma said.” I don’t think she even knew she did it, and Hillary did not seem to notice either. In case you wondered what title Hillary bears most proudly, it is, obviously, the one by which her daughter now refers to her. It is also clear with whom Chelsea spends much of her time conversing lately. Earlier, she had said she was “shameless in appreciation of her daughter and her mother.” Yes, Chelsea, we see that! We also agree! Here is an account of this and other 10th anniversary events thanks to Ruby Cramer who never fails to share! Thank you, Ruby! LITTLE ROCK, Ark. — It was a weekend to celebrate the 10th anniversary of the Clinton Presidential Center, a four-day reunion and retrospective of the 42nd president’s White House. But at her first public event here, Hillary Clinton did not reminisce much about the ’90s or recall the policies of her husband’s administration. Before a crowd of old friends, advisers, and political supporters on Saturday afternoon, Clinton led a conversation about her family’s foundation that focused on the work she did in Arkansas to advance women’s economic opportunity — and how it could be applied in the future.